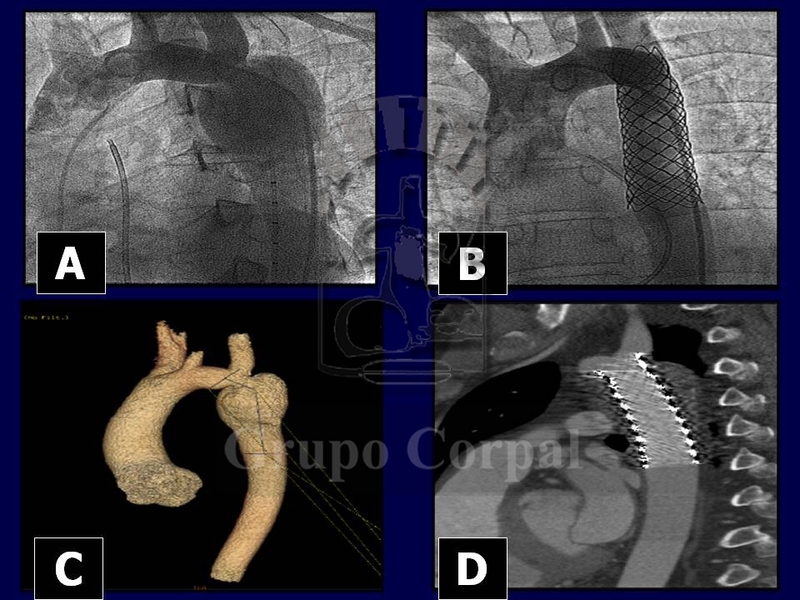 Stent implantation in Aortic Coarctation. Corpal Group. 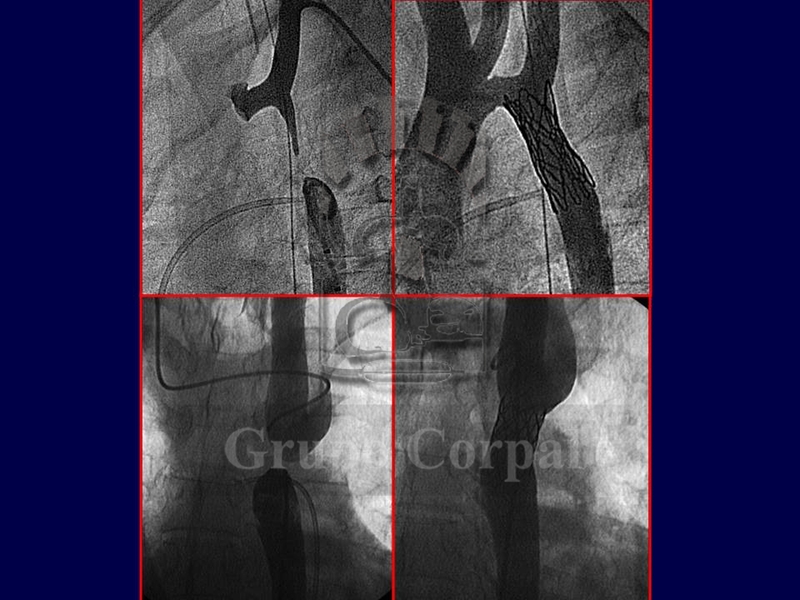 Aortic coarctation is one of the most common congenital cardiopathies. 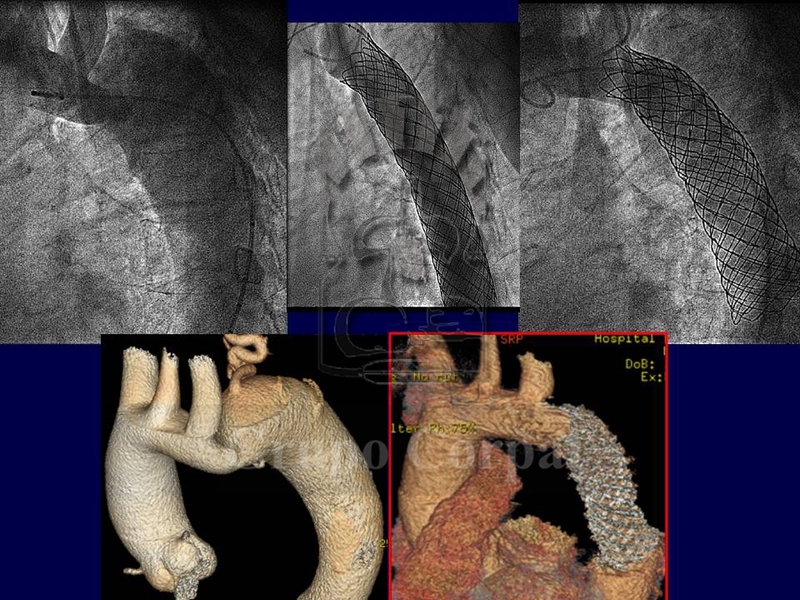 It involves the narrowing of the aortic span at the aortic arch that causes stenosis with cystic necrosis of the middle layer and weakening of the wall. 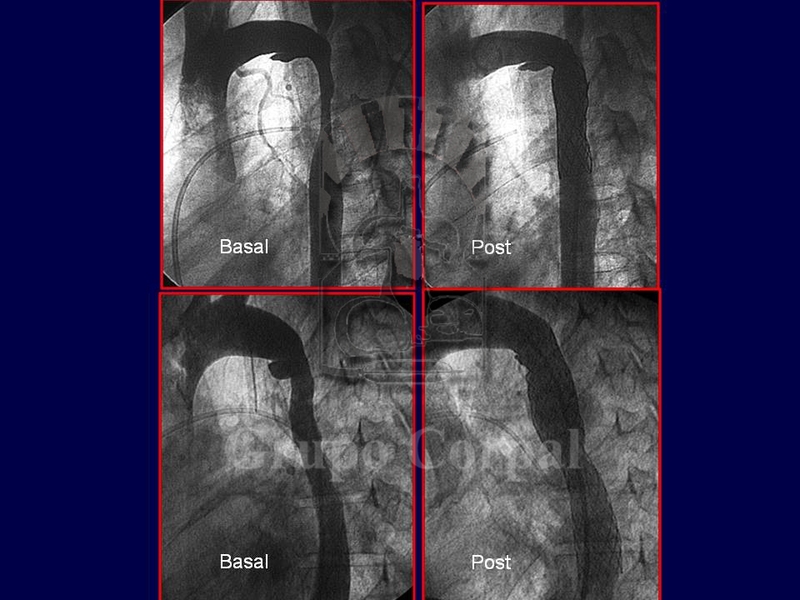 This systemic stenosis of the most important artery generates hypertension in the top part of the body (left ventricle, head and arms) together with hypoperfusion distal to the coarctation (abdominal organs and legs). The only possible compensation is the development of collateral circulation, which takes time after birth. Its clinical presentation can vary greatly. When very severe at birth, it presents with severe heart failure that is very difficult to treat. Otherwise, it can even go unnoticed. The subsequent development of collateral circulation enables normal development of the infant, child and adolescent, and they can reach adulthood without the problem being detected. It is often diagnosed by chance in routine examinations that discover a murmur or hypertension. Without treatment, serious complications can arise, including cerebral haemorrhage, aneurysms, intermittent claudication, heart failure and even aortic dissection and rupture. The classic treatment has always been surgery, successfully performed since 1945. 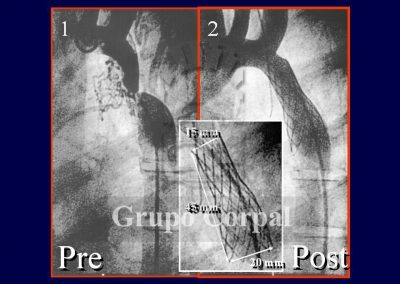 The main limitations were restenosis or recurrence and the development of post-surgical aneurysms. 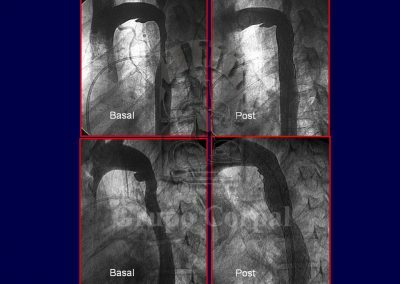 Percutaneous treatment (angioplasty) started to be used in 1982, albeit with the same limitations. 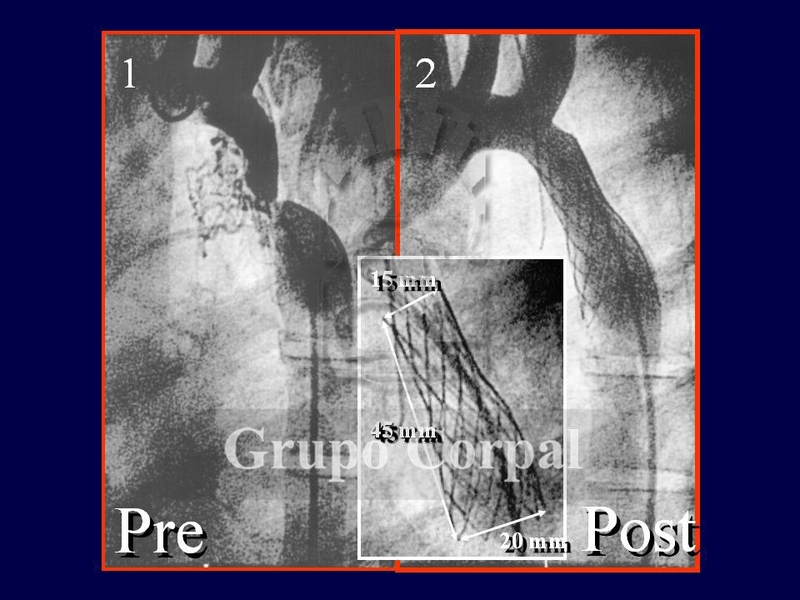 The advantage was the lack of thoracotomy and the use of a femoral puncture (references). Aware of these limitations, in 1995 our group published the first series in the world of patients with severe aortic coarctation treated with stents (references). Since then, their use has become widespread the world over and this is now the treatment of choice for the disease in children over 6, adolescents and adults. In neonates, infants and small children, surgery or balloon angioplasty is used, depending on the surgeon’s experience. 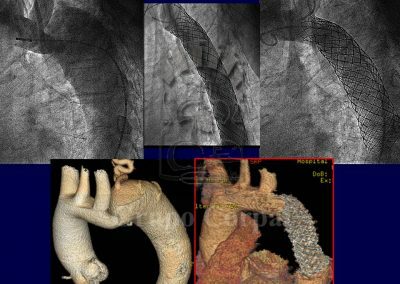 Like a scaffold, the stent supports and strengthens the aortic wall, with total disappearance of the stenosis and less subsequent aneurysm development. 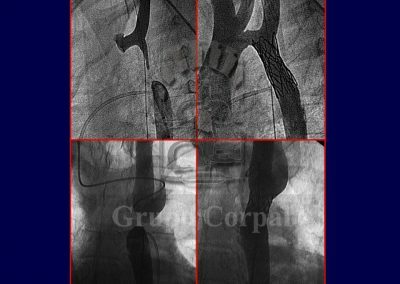 The coarctation is crossed in a retrograde manner, first with a catheter and then with a metal guide to carry the cannula with the stent, which is finally implanted with the inflation of a balloon catheter. When there is an aneurysm or risk of same, a covered stent is used to isolate it or prevent its development. The procedure is painful, and thus required anaesthesia.